Video is a wonderful thing. Life moves too quickly to see and process everything that’s happening. Especially at a Guy Fieri cooking demonstration. As I sat down to edit this video from Pebble Beach Food & Wine, I knew I had some interesting stuff. But I didn’t know I had… stage diving. Dana Cowin, Editor-in-Chief of Food & Wine Magazine stage diving. Stage diving!! I also talk Hunger Games with Anne Burrell, learn “the rule of breakfast” from Michael Chiarello and Guy Fieri makes gallons of cocktails like Isaac from Love Boat. Stage diving, people. Watch the video! Aside from the breath-taking location, one of the coolest things about Pebble Beach Food & Wine is that celebrity chefs are actually at their booths. Tim Love serves up mouth-watering Cabrito Tacos with Salsa Cruda and Pickled Chillies while dancing intermittently. Check out Tim Love’s Taco and all of my favorite morsels in Appetizer! 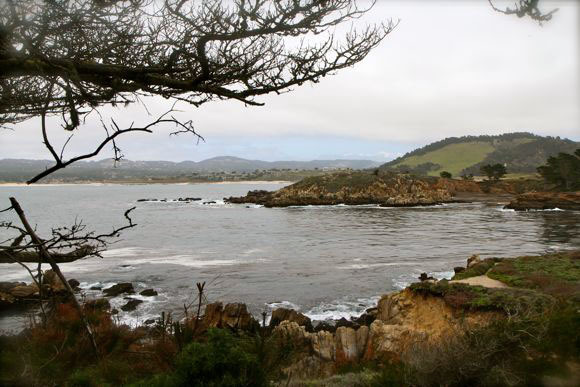 Pebble Beach Food & Wine 2012. 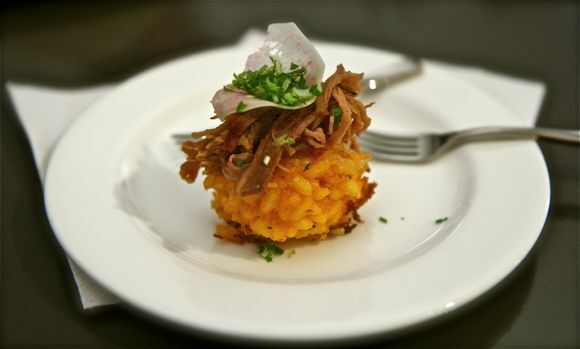 Chef Angela Tamura’s Saffron Risotto Cake with Braised Veal Shoulder, Watermelon, Radish and Sweet Garlic Rémoulade is another standout. Check out Appetizer! Pebble Beach Food & Wine 2012 to see more food from Pebble Beach Food & Wine 2012. Special thanks to chefs Anne Burrell and Michael Chiarello for your time and the laughs. Thanks for the XL T-shirt, Guy Fieri. 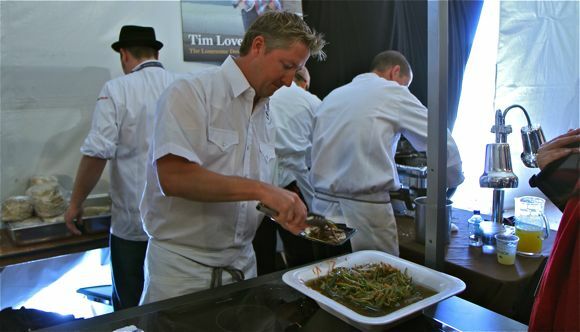 Pebble Beach Food & Wine is presented by American Express Publishing and Lexus. Impressively functional kitchens provided by Jenn Air. Big props to the incredibly good-looking and impeccably dressed team at Wagstaff Worldwide.